In this topic you will learn how to attach custom events and metrics to view events. The Audience player plugin includes a client-side API for attaching custom events and metrics to view events. The following example outlines how to track custom events and metrics. Obtain a reference to the Brightcove Player. This example assumes that an id of myPlayerID has been added to the player embed code. Listen for the Audience ready event, audience:ready. To track a string value, call player.audience.track(‘event[1-3]’, ‘value’). To track a numeric value, call player.audience.track(‘metric[1-3]’, value). The return value is a boolean indicating whether or not the event was sent successfully. Custom events/metrics stored on a view event will sync for Marketo REST and Eloqua if the fields are defined on the custom activity or CDO. Audience will also sync custom events/metrics to HubSpot if they're defined and to Salesforce if the integration is using a Mapping Type of Advanced and the events/metrics are mapped to something. 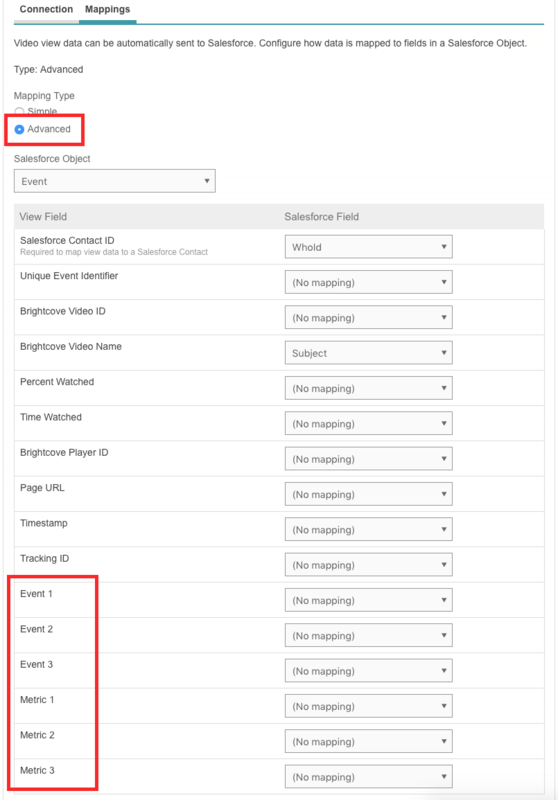 For Marketo REST integrations, publishers should verify that the Brightcove Video View custom activity in Marketo has the custom event and metric fields. Contact Marketo Support and ask them to add the fields. After the fields have been added, return to Audience and press the Complete Update button so Audience can access the newly added fields. For Eloqua integrations, publishers should verify that the BrightcoveVideoView custom object has the custom event and metric fields. Using the data mapping upgrade button. For Salesforce, your Audience connection should be using a Mapping Type of Advanced. 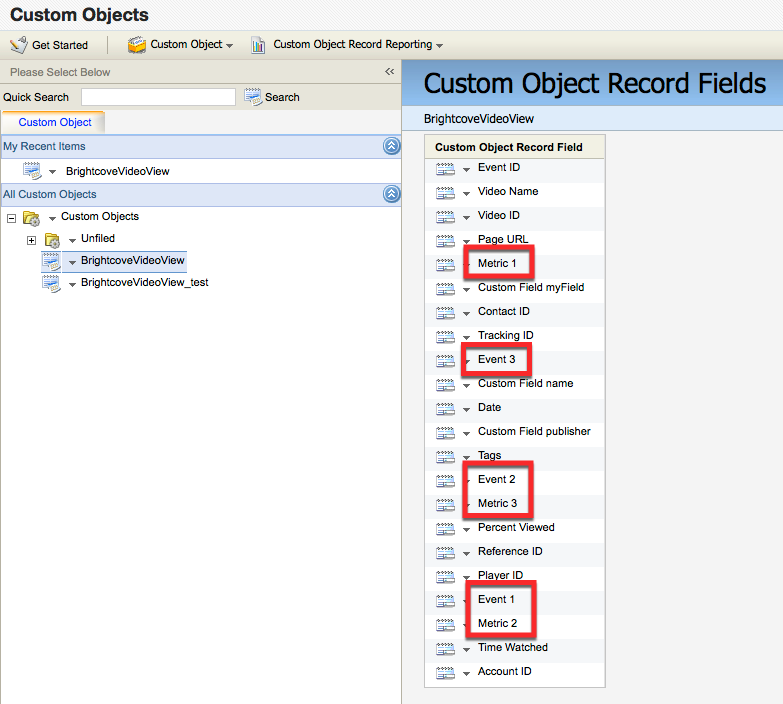 The Event and Metric fields can be mapped to Salesforce objects. The limit on string length for event slot values is 250 characters. If multiple values are sent to the same event or metric slot during a single viewing session, the existing value in the slot is replaced with the new value. In the following example, the final value stored in event1 is “click3”. If a view event for the session does not exist yet then one will be created. If the result of track() is false indicating that the event failed to send, you can enable the verbose option on the Audience plugin to see console logging with a specific reason why. Custom events and metrics will appear in the Audience UI. In the left navigation, click All Recent Activity. 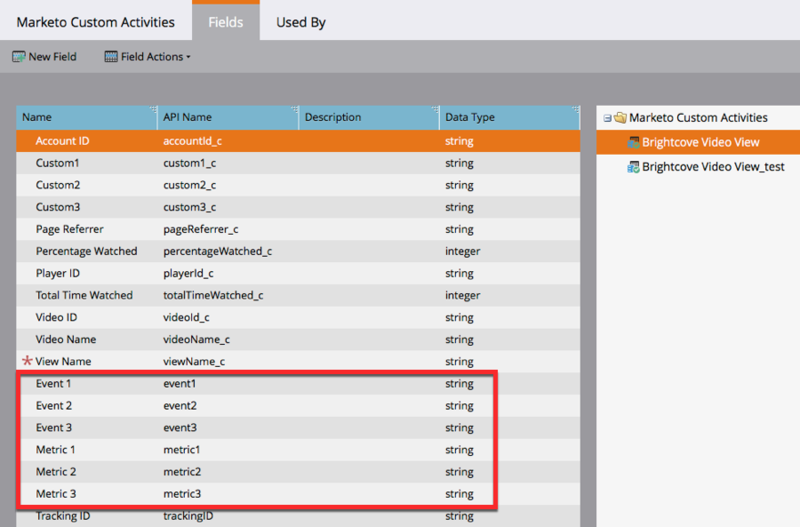 If any custom events or metrics have been recorded, the Show Interaction Events link will be enabled. Click the link to display the event/metric data.